- What Asian American issue are you most passionate about? - What is a pressing issue that affects your Asian American community and how that affects you? - How do you personally define your Asian American identity? *We reserve the right to refuse any submissions that we believe may be prohibited or inappropriate. 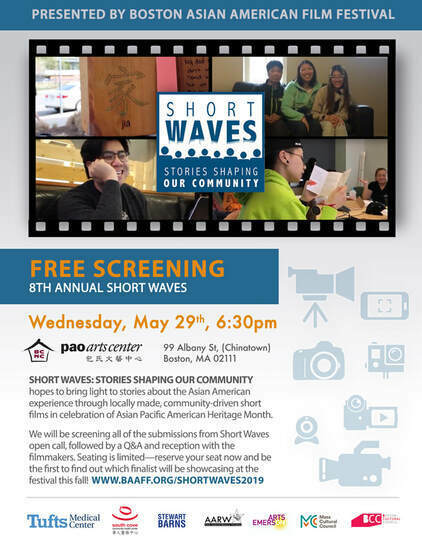 The 8th Annual BAAFF Short Waves: Short Film Competition hopes to bring light to stories about the Asian American experience through locally made, community-driven short films. Congratulations to Channeit Som, whose film, “Coming Out Wasn't Funny" won the 2018 Short Waves Film Competition. As the winner of Short Waves, Director Channeit Som will receive an all access festival pass and showcase her film at the 2018 Boston Asian American Film Festival this fall. It was a full house tonight at the screening. Thank you all for coming out to celebrate the last day of Asian Pacific American Heritage Month. This film focuses on the relationship with director Channeit Som's dad that she never really spoke in-depth about, only joked around about. In this story, she hopes to highlight that this narrative is still continuing even after this video is shown. In hopes, she want to show the dynamic of being from a bicultural generation and having intergenerational differences that many of you might be able to relate to. This film is about the director Minh Phan dealing with being lonely throughout his life and the ways that he failed and succeeded in growing to be less lonely and grow into my own skin. It follows the emotional journey he went through since he was 12 to current day. Directed by Wendy Z. & Jason L.
This film explore gentrification and issues affecting Boston's Chinatown while also exploring the work of installation artist, Risa Puno. This film is a time travel experience about director Yanyin Alexandra Cheung He's, appreciation for what her family went through for her to be where she is today, for their hardships, and for giving me a taste of three different countries. She want people to be encouraged to find out about their family history. History cannot be known if it is not discovered and documented. I made this film to explore my grandmother's story of her life in China and in America, and my experience working on this film led me to reflect on my own life as an Asian-American. My digital story centers around my person experiences at the Boston Marathon bombing in 2013. A specific moment I shared with my mother that day has provoked a deep search into my past to find other moments when she was unable to be there for me. It's about me coming to terms with the realities of life and slowly accepting the new responsibilities I've been given, despite not being ready to do it. Portraits of Chinatown: History of Public Art » Bryanna B. & Jonathan L.
This film celebrates the work of Wen Ti Tsen, A-VOYCE's Tied Together with a Thousand Threads, and Risa Puno's recent installation at the Chinatown Park. Portraits of Chinatown: The Work of Risa Puno » Stephen L & Yassir M.
This film explores the work of Risa Puno. I started to develop anxiety through Filipinx cultural performances as a child. My performance anxiety transfered onto my educational performance later on in life. With the help of community and therapy, I was able to rediscover myself and realize the importance and power of my own voice. Tak Toyoshima is the creator/illustrator of Secret Asian Man, a comic strip that highlights the nuanced, hilarious, and often tragic dynamics of race relations in America. He is also the creative director of Rustic Marlin, a home decor manufacturer specialized in handcrafted signs and furniture. Ngoc-Tran Vu is a 1.5-generation Vietnamese American multimedia artist and organizer. Born in in Vietnam, she grew up in Boston's Dorchester neighborhood where she's currently based. Tran is the Program Director at AIR (Association of Independents in Radio) and also a board member of AARW. Teja Arboleda is the president of Entertaining Diversity, Inc. which focuses on diversity and inclusion programming through entertainment. He has produced and edited documentaries for PBS and Discovery, and won an EMMY award in 1993 and five Telly Awards (2009, 2013, 2017 and 2018). He is adjunct professor of communication at Clark University and has presented in over 1,300 cities and towns in America. With racism at an all time high in the US, members of an elite squad known as the White Fragility Special Victims Unit set out to help people of color in the fight against social injustice.